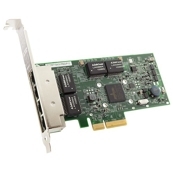 The NetXtreme II 1000 Express Quad Port Ethernet Adapter is a high performance PCI Express, quad-port, copper Gigabit Ethernet network adapter supporting both NIC/TOE and iSCSI over a single network connection. The NetXtreme II 1000 Express Quad Port Ethernet Adapter is an ideal way to implement a virtualization solution using your existing Gigabit Ethernet network. With four copper-based Gigabit ports on a single PCI Express 2.0 x4 interface, the adapter provides the density and capacity you need to support large numbers of virtualized systems on one server.